A clean and highly visual penetration effect, which you can perform on a large stage or even a drawing room, completely surrounded by the audience. 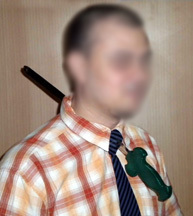 This is the famous Sword Through Neck illusion, constructed in a neck tie. As a result you have a sword apparently going through the bare neck without any shielding by a “frame” or “stock” as in the popular model of this item. The performer displays a sword, that can be demonstrated as rigid, (swished in your most cavalier manner), and sharp, (slicing pieces of a banana). A sporting, though reluctant assistant is coaxed into participating in the “experiment”. The sword is pushed right through the assistant’s neck and it visibly emerges at the opposite end. It is then pulled out again to show the assistant is perfectly unharmed. Superior quality props, with special tie that makes this possible, and stainless steel sword and scabbard (you wouldn’t keep a naked sword in your bag ! ).